Sure you need a mitten craftivity! As I was making my sample, I realized this craftivity can be adapted a zillion different ways. Don’t you just love it when that happens? 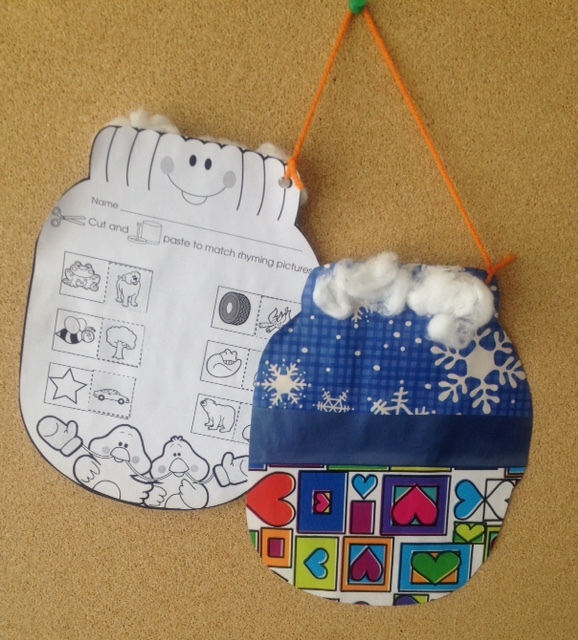 Each mitten shape features rhyming practice. If your students are already down with rhyming skills, no worries. There are plenty of other options. After each activity is completed, a student glues wrapping-paper strips to cover the back of each page. Then she turns the papers over, cuts out each mitten shape, and hole-punches each cutout where indicated. She connects the cutouts with a length of yarn. I glued some cotton to the cuffs too. Get the skill sheets and directions here. Or get patterns for a pair of mittens here and have students complete a practice activity inside each mitten pattern. For example, students can list pairs of synonyms on one mitten and pairs of antonyms on the other. They can write mitten stories, solve math problems, or write their spelling words for the week. You decide what best fits your students’ skill needs! PS There are only a few days left to enter our giveaway for the month of January. Check it out here!